This go cart was more than we expected. It has a lot of fun features like an alarm and remote start that we all love using. It's pretty fast too so the boys have enjoyed using it and showing it off around the neighborhood. Great purchase and a lower price than any other website around! my grandson loves the kart.....every part of the transaction went off without a hitch.....excellent customer service throughout. assembly requires mechanical skills and knowledge of small engines.....website pictures are more helpful than Chinese documentation supplied. After visiting several websites and making a few calls I purchased my 8 year old grandson a GK-F031 as a Christmas gift. Without question the PowersportsMax website is the best and customer service is just as good. The whole transaction from ordering to delivery when off without a hitch. For the money the kart is amazing with features one would not expect. The workmanship and quality is good and all of the hardware needed for assembly was included. I did not need a manual to complete the final assembly and break-in which is good because what is supplied by the Chinese manufacturer is not much help. Actually the pictures on the website are so good that your average auto or motorcycle mechanic can complete the assembly without instructions. My grandson's comment after riding for about an hour in 30 degree weather on Christmas day. "This is the best day of my entire life"
After buying hundreds of items online, this is the first time I've ever written a review. Sweet little Go Cart delivered right to my door... no brainer. Looks great, started right up easily. I like the Gk-F031 that I received from power sports max . Yes I would people have all ready asking me about the bike. 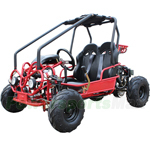 We enjoyed driving the go kart for several days before I posted this review. During this time we learned how to increase the maximum speed. Ok - just thought I would share my first full day riding experience (The only reason I am able to type is my wife is out riding it with the boys ) First I want to say I was really unsure if I wanted to get a 125 or a 150 - I went with the 125 and feel this was the right decision. I am 5'6" and am very comfortable with my son next to me. The only 1 problem is I need 3 seats with 2 boys I always had someone upset that could not ride. Looks like I may be making another pruchase in the next year or so. I bought this go-kart for my daughter as Bday present. She loves it so much and very happy to have this one. We spent Bday noon riding together with her new Go kart. It is very joyful seeing my daughter so happy. This go cart was more than we expected. It has a lot of fun features like an alarm and remote start that we all love using. It's pretty fast too so th ..